US Economy in Q1 2018 increased by a 2.3% annualized rate – not as good as first projected but recent history has the first quarter underperforming so not too much of a surprise. The survey pegged growth at +2.0% so it did beat expectations. The Atlanta Federal Reserve is projecting +4.0% annualized growth for Q2 – a big pick-up – but that is where the Q1 estimates started before being cut almost in half. The economy may expand still by a good +2.8% in 2018, according to the median of forecasts compiled by Bloomberg. 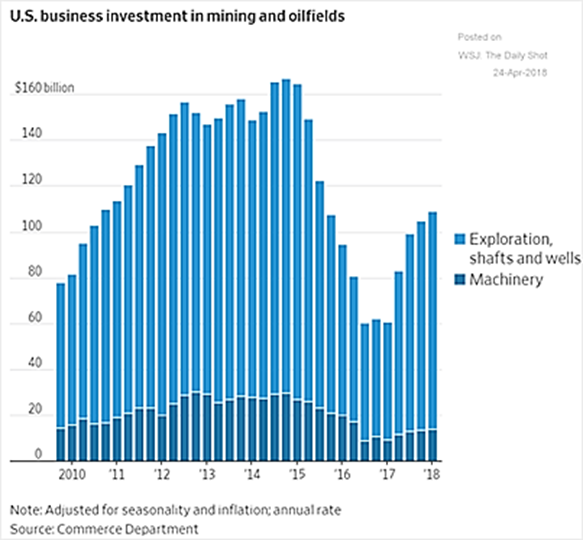 The impact of expanding oil production on investment can be seen in the graph to the right, which should be supportive to industrial production and GDP statistics for the year. A number of underlying metrics were decent to good, with U.S. March factory goods orders +1.6% (versus estimates of +1.4%), the U.S. merchandise-trade deficit shrank in March to a six-month low as imports plunged by the most in two years but exports increased to the highest level since 2008 and factory output rose +0.1% (matching estimates) after an upwardly revised +1.5% increase that was the biggest since July 2009. Jobless claims continue to fall, running at 210,000 versus 650,000 at the depth of the recession. April’s unemployment fell to 3.9% from 4.0% and the underemployment declined also (to 7.8% from 8.0%). There are a number of neutral to negative signs, however. Hourly earnings rose by only +0.1% in April (though overtime hours ramped). US core inflation (CPI) was up +2.1% and +2.4% overall year-on-year, supporting the interest rate increases outlined by the Fed. US existing home sales were flat at 5.60 million annualized seasonally-adjusted vs 5.55 expected – a similar level since late 2016. Non-military, ex aircraft capital goods orders unexpectedly fell in March (-0.1% versus estimated +0.5%) and February’s orders were revised down to +0.9% from +1.4%. These weak numbers fed into the sluggish Q1 GDP number. 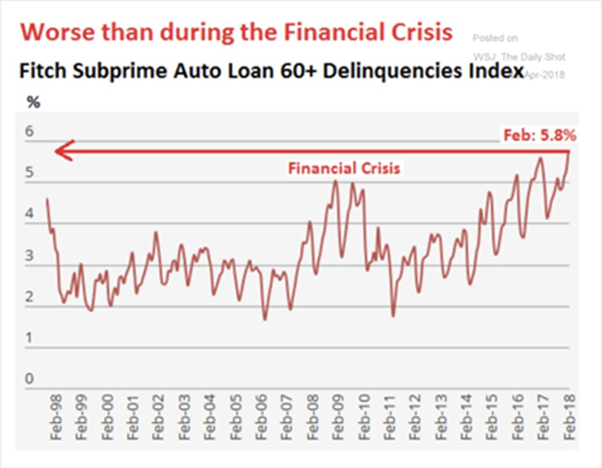 A Few Items to watch out for include the steady deterioration of the weakest consumers as demonstrated by the rising delinquency rates in sub-prime automobile loans seen to the right. 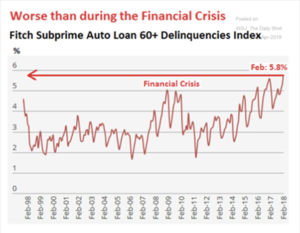 The first independent sub-prime auto lenders have gone bankrupt as well. 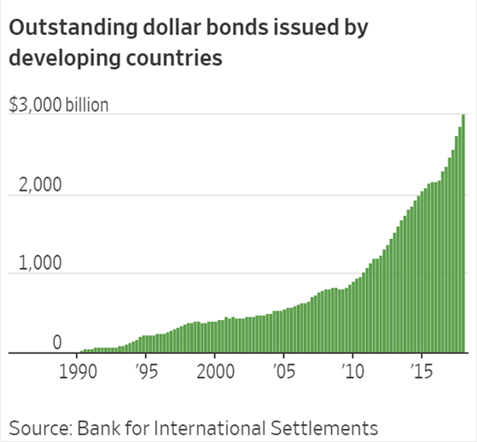 The total dollar figure at $280 billion is nothing like the trillions in bad home loans from the 2008 recession but it does not bode well. The main banks are not directly involved but they lent billions to the specialized lenders that started to go bankrupt (e.g., Summit Financial and Spring Tree Lending in March). Manageable risk in isolation but rising rates will affect other consumer spending – home loans, credit cards, student debt and so on. Announced closing of retail chains have already added 77 million of square feet of retail real estate to the market, rivalling 2008 and closing in on last year’s record 105 million square feet last year. States and municipalities too are starting to feel the pinch. Illinois began garnishing a city’s tax revenue to force the agreed contributions to the state-run police pension plan – and forty public safety workers had to be laid off to offset the additional expense. The state’s budget deficit broke $14 billion, the highest ever and $4 billion more than last year. And yes, Puerto Rico is getting federal dollars up front in anticipation of receiving rebuilding funds… but this money will cover current expenses, and will not be used for reconstruction. Eating today and starving tomorrow. 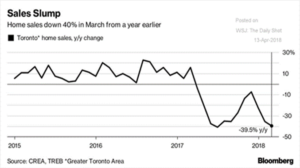 Finally, the US may suffer from a Canadian disease – Toronto home sales are running 40% lower year-on-year and higher rates are hitting mortgage holders (not just new mortgages as Canadian rates typically reset every five years as opposed to staying fixed for longer terms, e.g., as much as thirty years in the US). Eurozone GDP growth disappointed with a +0.4% quarter-on-quarter increase (+1.6% annualized) for the first period in 2018, again raising talk that the ECB will extend rather than taper its bond-buying program. The EU is looking to increase its budget starting in 2021 by about 12% to €180 billion per year but the 27 countries will have to fill in the hole left by the UK of over 7% for a total increase of roughly 20% on a per-county basis. With cuts to agricultural subsides, monies to the poorest members and customs duties kept by the individual countries, everyone has to pay more or receive less. Let the political fun begin! 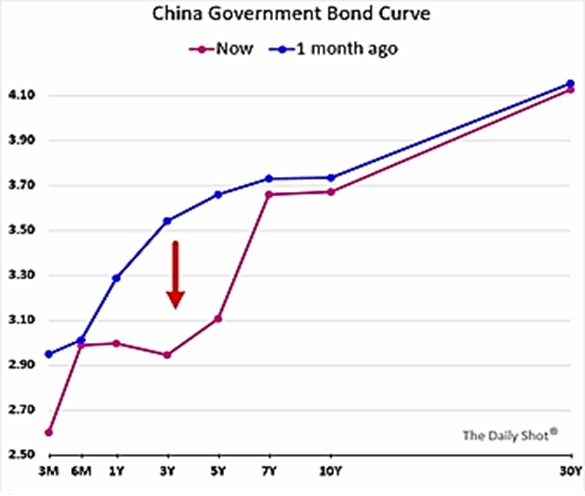 At least there will be a renewed supply of bonds for the ECB to buy! The questions around the multi-country Iran deal to end sanctions threatens €20 billion of annual trade with the EU (compared to $200 million between Iran and the US) as well as billion-euro contracts for gas-production investment and automobile manufacturing (France’s Total and Renault respectively). Given the struggling GDP number and export-led Germany, it is unlikely that Europe will go along with Trump if he decides to renew sanctions. 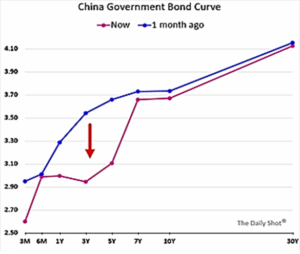 China’s Government took steps to keep their economy moving, lowering the capital reserve requirement for banks by 1.0% to allow further leverage in the financial sector. Furthermore, they lowered interest rates out to five years to allow corporate issuers (particularly property developers) to refinance at better rates (see graph to the right). Some of the closely-watched numbers came in fine for March with industrial production below expectations at +6.0% year-on-year versus +6.3% forecasted, but retail sales were better at +10.1% year-on-year versus the survey’s +9.7%. March exports fell -2.7% but shipments were likely moved forward into February due to the timing of the lunar holiday. Power usage in March also grew less than the previous quarter (+5.8% versus +8.2%). As the graph below shows, non-financial corporations are engaged in de-levering over the last few months but the rest of the economy (government entities, households and financial firms) is making up for it and more. The rate of increase has slowed but with a larger and larger GDP, the currency value of the new debt is still increasing faster than the change in GDP. 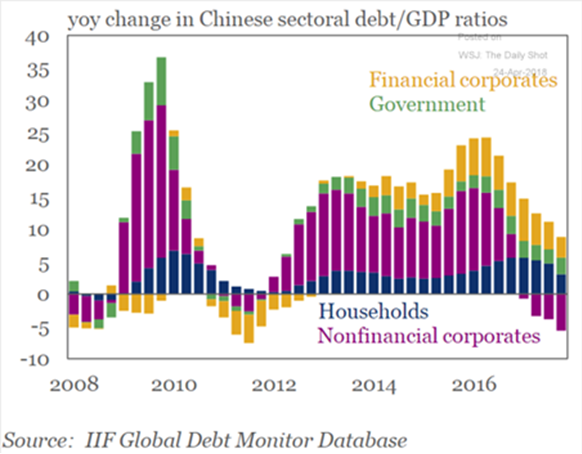 The ratio increased 54% over the last five years and is around 260% of GDP (versus about 380% total debt-to-GDP for the US). There is still room to lever up, one may argue, this blistering pace is historically associated with poor investment decisions as seen in other countries. Russia is tying itself closer with a potential deal to export aluminium directly to China, in addition to crude oil, to further avoid European and US sanctions. Senior US negotiators were in China in early May to attempt to halt the back-and-forth escalation of threatened tariffs but walked away with little but “we are still talking.” With geopolitics as well as economics as sources of tension, this process will be a challenge for both sides. Japanese Industrial Production grew +1.6% year-on-year in March but again missed expectations (+2.3%). Q1 2018 GDP growth will be released in mid-May. South Korea’s exports also unexpectedly declined year-on-year, missing as positive forecast. Finally, a critical bottleneck will soon be removed in Belgium, as its first major beer pipeline will start pumping beneath Bruges, in September.